Among the earliest arrivals to the Loudoun Valley of Virginia were Amos and Mary Janney, members of the Religious Society of Friends (Quakers). In 1733, Janney purchased 400 acres along Catoctin Creek. By the early 1740s, he had built a mill of logs for grinding flour and sawing wood. As fellow Quakers came to the area seeking fertile farmlands, a settlement grew up around "Janney's Mill." Local farmers brought their wheat to the mill for grinding, and by 1762, Mahlon Janney, Amos's son, had built a larger, two-story mill of wood on a stone foundation. Through the end of the 18th century, the settlement at Janney's Mill drew Pennsylvania Quaker, German Lutheran, and Scotch-Irish Presbyterian small farmers. As Loudoun County built and improved roads, the village grew rapidly. 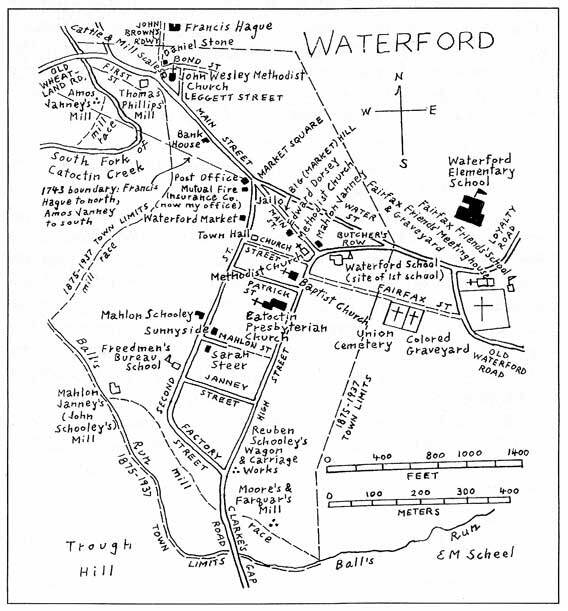 Homes and shops were built, and in the 1790s the settlement was renamed Waterford. 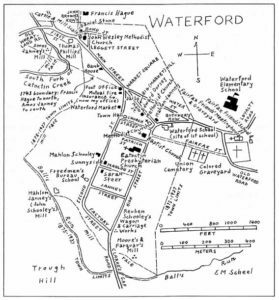 Waterford continued to prosper and reached its manufacturing height in the mid 19th century. By 1835, a Virginia gazetteer noted that Waterford was a flourishing little village of "seventy dwelling houses, 2 houses of public worship, 1 free for all denominations, the other a Friends' meeting house, 6 mercantile stores, 2 free schools, 4 taverns, 1 manufacturing flour mill and 1 saw grist and plaster mill, and (in the vicinity) 2 small cotton manufactories. The mechanics are 1 tanner, 2 house joiners, 2 cabinet makers, 1 chair maker and painter, 1 boot and shoe manufacturer, 2 hatters, 1 tailor. Population about 400 persons; of whom 3 are regular physicians. The following year, in 1836, the thriving town was incorporated at its own request, and the 12 newly-elected commissioners appointed their first mayor, recorder, and sheriff. By the middle of the 19th century wheat remained important to the local economy. Janney's second mill had been rebuilt and enlarged on the same foundation around 1818. The new three-and-a-half story brick mill doubled the previous capacity, reflecting the fertility and high wheat yield of the surrounding farmland. Quaker historian Asa Moore Janney noted that Yardley Taylor's 1853 map of Loudoun County showed 77 mills of various kinds in the county, of which 30 were wheat mills. By the 1850s, Waterford's mill was producing flour for a wider market than just the village because the nearby Chesapeake and Ohio Canal and Baltimore and Ohio Railroad greatly improved the town's links to distant markets. Mill entries from 1849 show barrels of flour being hauled to Point of Rocks, Maryland, where they were loaded either onto Chesapeake and Ohio Canal barges or Baltimore and Ohio Railroad freight cars. In the Waterford area alone, by 1860, an estimated 80 farmers were producing more than 40,000 bushels of wheat, or about 500 bushels per farmer, an increase over the previous decade.